﻿ book pick: it’s all too much. book pick: it’s all too much. So I mentioned earlier this week that my husband and I have a great de-cluttering problem to tackle in our home. We’re not the worst collectors in the world, but I think that we can both agree that we have too much stuff. At my last job, I could get nice, quality purses for free or almost free. I already had a purse collecting problem. So suddenly I had the power to binge collect purses that I’d never be able to afford on my own. And I actually reached a purse saturation point, if you can believe it. I had too many purses and couldn’t handle the thought of getting just one more. 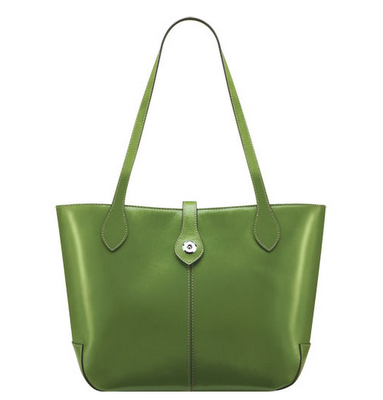 I mean, can you imagine the level of purse overload that would enable me to say “no” to taking home this beauty? That’s what I’m trying to tell you. I already had way too much. So right now, the future baby’s room looks like a storage shed of lots of different things. My purses. Mike’s miscellaneous camera and film equipment. My wedding dress that I swore I’d sell immediately. Bedding for sizes of beds that we don’t even own. The list goes on. 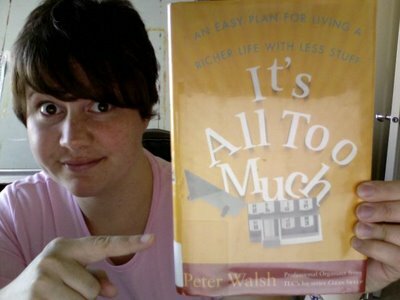 Then, this week my friend brought over a book that she’s borrowed from the library called It’s All Too Much by Peter Walsh. The front cover also says “An easy plan for living a richer life with less stuff.” Right now, that sounds appealing to me. Really appealing. I haven’t started to read it yet, but there are a couple things that make me confident that this will be a good book. First of all, it starts with a quote from Fight Club, which I haven’t actually seen, but a book with a quote from Fight Club can’t be stuffy at all, can it? The book is divided into rooms, too. So I can read the home office chapter. And the master bedrooms chapter. I feel a great purging coming on. My friend read it in just a day or so. I think I’ll do the same. Wish me luck! This is perfect for me today. I just decided to get rid of a bunch of stuff and now have to fight with my kids over what goes and what stays. I’m adding this book to my list of books to read and I’m listing all sorts of stuff on ebay and craigslist. Thanks for sharing. Now that I’m finished purging all my stuff, I have space for some of those hand me down purses! I LOVE Peter!! Well, that IS the name of my husband :), but I’m referring to Peter Walsh here… :) I was a huge fan of the TLC show he was on a handful of years ago called Clean Sweep…and more recently, he’s been on Oprah a few times. He is a GENIUS! So helpful to those he works with. I haven’t yet read his book, but you reminded me that I’ve been wanting to–even though I’m familiar with his words of advice. I highly recommend what he recommends! This post came at the perfect time! I just purged 95% of my closet after reading Louise Hay’s You Can Heal Your Life. She’s more a positive-law-of-attraction-lecturer, so I think I’ll check this book out at the library. A closet can be somewhat easy to purge, but the other rooms seem more challenging and I could use a plan/motivation. Thanks!